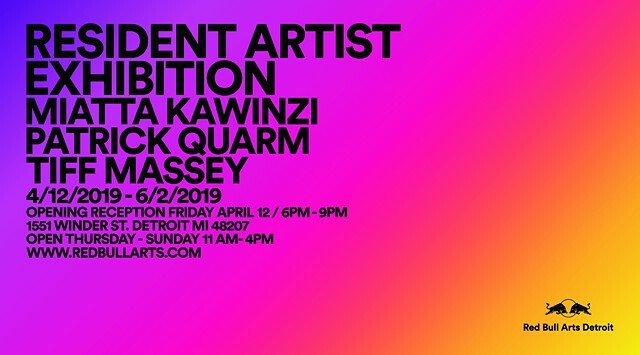 Detroit, MI: Please join us on Friday, April 12th from 6-9pm for the opening of a group exhibition of works completed during the three-month artist residencies of Miatta Kawinzi, Patrick Quarm, and Tiff Massey. 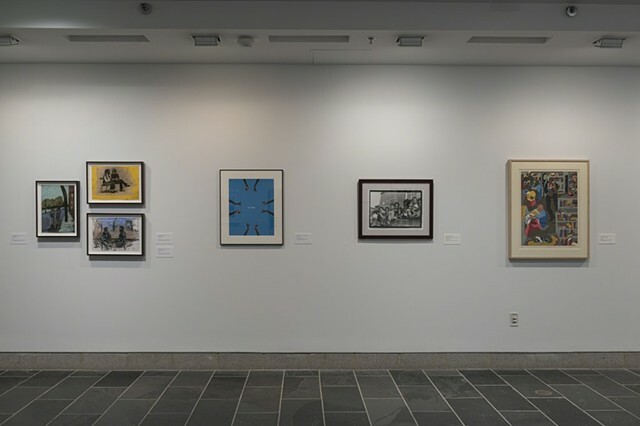 Andover, MA: Harlem: In Situ explores the depth and complexity of this renowned neighborhood, highlighting the work of some of the most important visual artists working from the late 1920s through today. Initially inspired by the Addison’s trove of Harlem street-photography, this show also includes prints from the collection by Romare Bearden, Elizabeth Catlett, James Lesesne Wells, and Vincent D. Smith, as well as several key works by nearly a dozen artists, working across time and media, including Charles Alston, Jordan Casteel, Aaron Douglas, Miatta Kawinzi, Alice Neel, Lorraine O’Grady, and Kehinde Wiley. These artists and their works investigate the legacy and trajectory of Harlem, which encompasses mass migration, opulence, cultural renaissance, depression, demise, empowerment, pride, and gentrification. 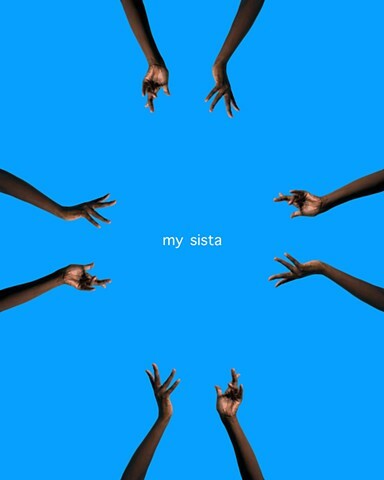 I am pleased to be a Visual Arts contributor to the inaugural Dancing While Black Digital Journal, with thanks to Visual Curator Nontsikelelo Mutiti. This Journal was produced by Angela’s Pulse and developed and designed in partnership with the Hemispheric Institute of Performance and Politics and PURPOSE Productions, with funding from The Surdna Foundation. Detroit, MI: Please join Red Bull Arts Detroit on Thursday, February 21st at 7pm for our inaugural “Viewfinder” discussion. 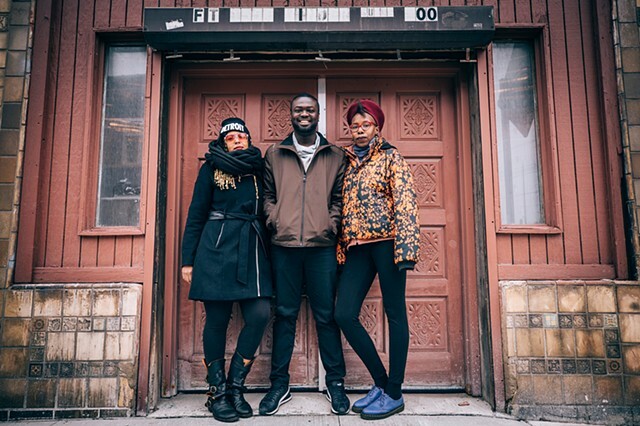 This panel discussion will engage our three current Resident Artists Miatta Kawinzi, Tiff Massey, and Patrick Quarm, in a discussion about place, how it relates to identity, and the varied ways in which that manifests in each of their practices. Moderated by Michael Stone-Richards, the discussion will be an entry point into the work of all three artists and lay the stage for their exhibition, opening on Friday, April 12th. From left to right: Kimberlee Venable, Ayanna U’Dongo, Anna Burholt, Tandis Shoushtray, Miatta Kawinzi, Vanessa Haroutunian, Cecilia Dougherty, Erica Cho, Carmel Curtis, Lynne Sachs, and Peggy Ahwesh. Image by Tiph Browne. 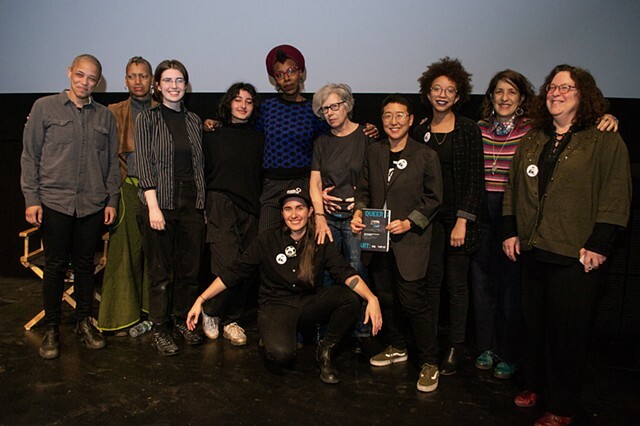 NYC: I am so immensely grateful to receive the 2018 Barbara Hammer Lesbian Experimental Filmmaking Grant, administered by Queer|Art! Release: Last night, a full house packed the main theater at the IFC Center in Greenwich Village to celebrate New York-based filmmaker and multi-disciplinary artist Miatta Kawinzi, who was announced by New York City-based non-profit Queer|Art as the winner of the second annual Barbara Hammer Lesbian Experimental Filmmaking Grant. 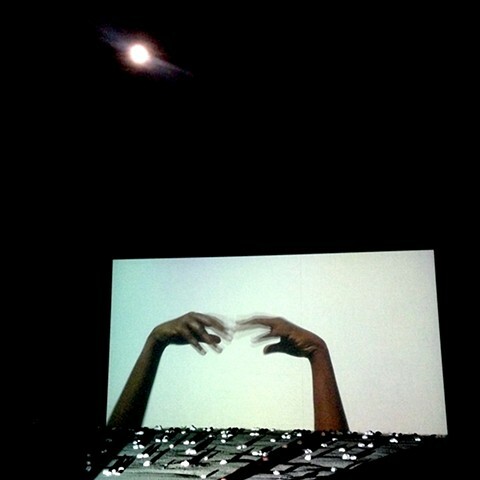 Kawinzi will receive a $5,000 cash grant to support the making of a new film installation: “SHE GATHER ME”. 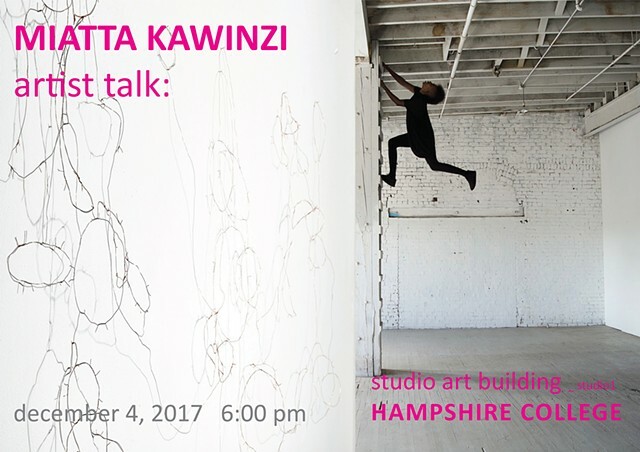 Join us for a multi-disciplinary art exhibition - It’s not about space, it’s about s p a c e - showcasing the work of students from the Fall 2018 Five College Advanced Studio Seminar - Committed to the Idea: Conceptual Cohesion Across Mediums, taught by Professor Miatta Kawinzi at Hampshire College. This work considers the concept of space as physical, social, emotional, and temporal, posing questions that suggest divergent narratives and open up s p a c e for new interpretation and exploration. Reception: Wednesday, December 12th, 2018, 6 - 8 pm. Exhibition dates: Monday, December 10th - Thursday, December 13th, 2018. 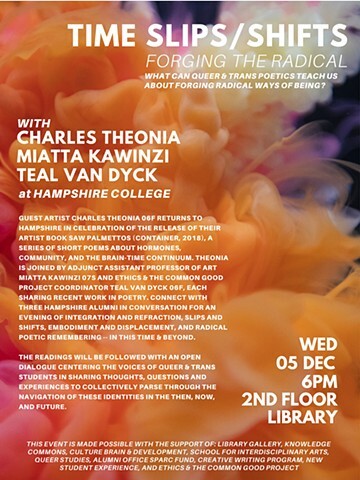 What can queer & trans poetics teach us about forging radical ways of being? 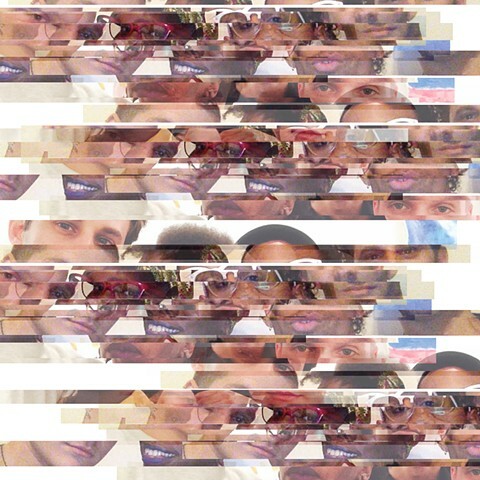 Guest artist Charles Theonia 06F returns to Hampshire College in celebration of the release of their artist book Saw Palmettos (Container, 2018), a series of short poems about hormones, community, and the brain-time continuum. Theonia is joined by Adjunct Assistant Professor of Art Miatta Kawinzi 07S and Ethics & the Common Good Project Coordinator Teal Van Dyck 06F, each sharing recent work in poetry. 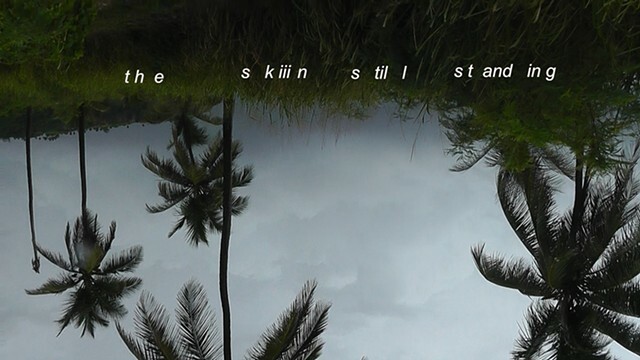 Connect with three poets in conversation for an evening of integration and refraction, slips and shifts, embodiment and displacement, and radical poetic remembering -- in this time & beyond. The readings will be followed with an open dialogue centering the voices of queer & trans students in sharing thoughts, questions and experiences to collectively parse through the navigation of these identities in the then, now, and future. This event is made possible with the support of the Library Gallery, Knowledge Commons, School for Interdisciplinary Arts, Creative Writing Program, Queer Studies, New Student Experience, Alumni Office SPARC Fund, Culture Brain & Development, and the Ethics & the Common Good Project. 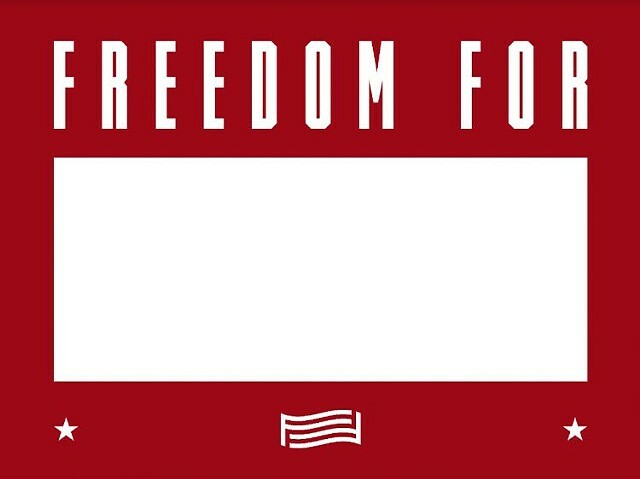 Amherst, MA: Organized by The University Museum of Contemporary Art, For Freedoms' Co-Founder Eric Gottesman will moderate a panel of artists and educators in a For Freedoms Town Hall to explore and discuss the role of democracy, art and civic action today. Panelists will include: Stephanie Shonekan, Chair of Afro-American Studies, UMass; Joseph Krupczynski, Director of Civic Engagement and Service Learning, UMass; and Miatta Kawinzi, multidisciplinary artist and Adjunct Professor at Hampshire College. Free & open to the public; food will be served. For Freedoms uses art to encourage and deepen public exploration of freedom in the 21st century. 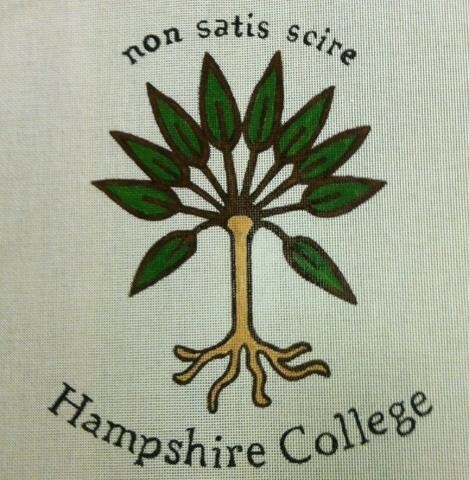 Amherst, MA: I am incredibly honored to be back at my alma mater, Hampshire College, as an Adjunct Assistant Professor of Art this fall. 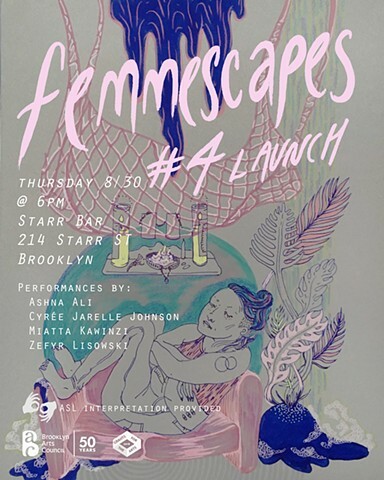 NYC: I am honored to be a featured artist in Femmescapes Vol. 4, a magazine that presents work by queer and trans artists and writers who experience an affinity with femmeness, edited by ray ferreira, Abigail Lloyd & Charles Theonia. Access Info: Starr Bar is wheelchair-accessible with gender-neutral bathrooms. ASL interpretation will be provided. We ask that attendees please refrain from wearing scented products. If you have access questions/requests, email femmescapesthezine@gmail.com. 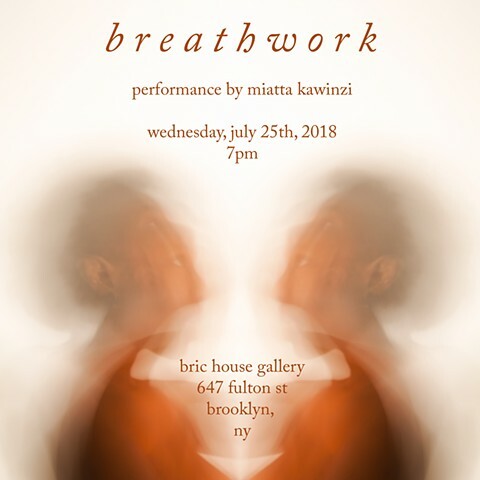 NYC: In conjunction with the Alchemy exhibition, join us for a performance by Miatta Kawinzi that will use language, movement, and live/recorded sound to explore different kinds of power. Kawinzi will use sound as a force within space to alchemize hardness into softness, giving particular resonance to this transformation in this moment of ongoing societal discord. 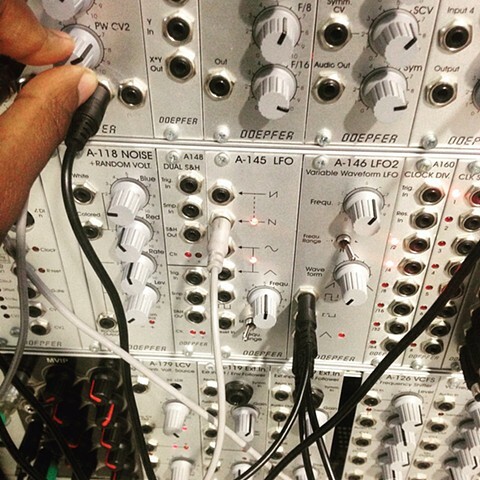 NY: I am honored to be an Artist-in-Residence at Alfred University's Institute for Electronic Arts where I will be deepening my knowledge in the production and techniques of sound art through experimentation and the development of new work. 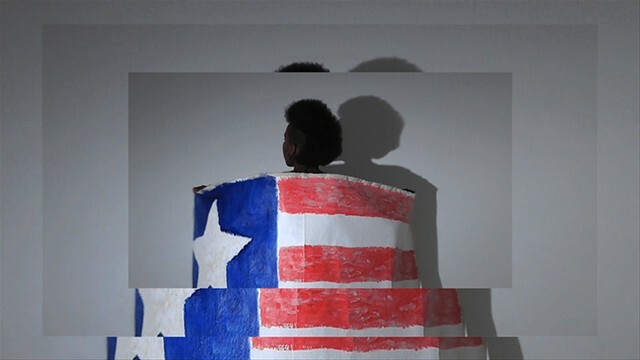 Miatta Kawinzi, Star Spangz, 2013. Video Still. Oakland, CA: CTRL+SHFT Collective is pleased to announce Social Objects, an exhibition curated by Emilia Shaffer-Del Valle and featuring the work of Lukaza Branfman-Verissimo, Lizania Cruz, Miatta Kawinzi, Camille Lee, Stephanie Lindquist, Zach Ozma, and Grace Rosario Perkins. Social Objects is about how and why we communicate – with one another and with ourselves, in intimate spaces, and as a member of broader societies. Every day we share, respond, and question, and every day we make choices – meditated or subconscious – about how to convey these thoughts. In eras of revolution and resistance, as ours is now, our choices regarding what and how to communicate carry particular weight. 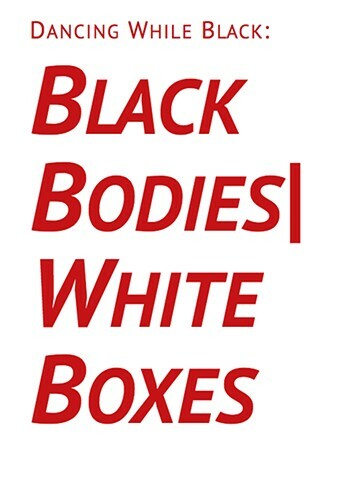 The exhibition focuses particularly on artists identifying as FQTPOC (Female, Queer, Trans, and/or People of Color) who use and meld the four primary forms of communication – text, movement/the body, visual imagery, and sound. 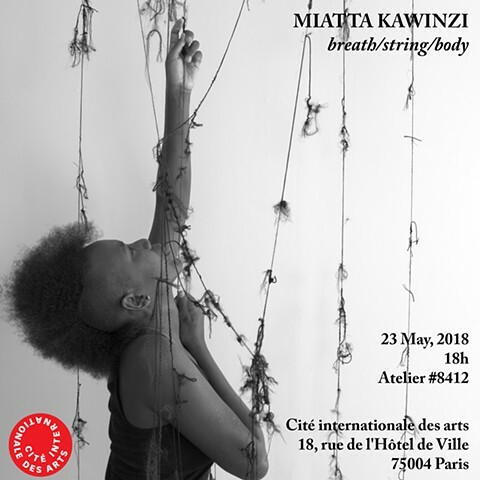 Miatta Kawinzi, Pouvoir, 2018. Video Still. NYC: Alchemy presents the work of seven artists whose work reflects new ways of thinking about the ancient concept of alchemy – the transformation of matter. Employing diverse media, these artists transform non-conventional materials to create visually layered statements about the body and gender, race, and the environment. Their work – including large-scale installations and work commissioned by BRIC – also manifests the potential for the spiritual to be drawn out from the quotidian world around us. 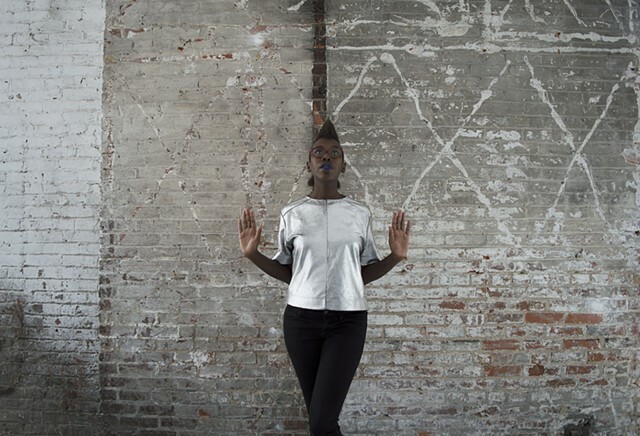 As is BRIC’s tradition for summer exhibitions, Alchemy will be accompanied by a series of lively Wednesday evening and Friday afternoon public programs including those dedicated to conversation, performance, dance, and the healing arts. France: As a participant in Lower Manhattan Cultural Council’s Paris Residency program at the Cité internationale des arts, sponsored by Mairie de Paris/Mayor’s Office of the City of Paris, I have been researching African diasporic histories and presences in Paris and reflecting on my findings and experience in new work using ink, string, sound, video, and performative gestures. This work explores themes of alienation and belonging, the layered nature of identity, and the shifts between internal and external perceptions of the self and the “other” (and the other selves) as conflated by time, space, and movement. I will be sharing this work in breath/string/body. France: I am incredibly honored to be a participant in Lower Manhattan Cultural Council’s Paris Residency program at the Cité internationale des arts, sponsored by Mairie de Paris/Mayor’s Office of the City of Paris. 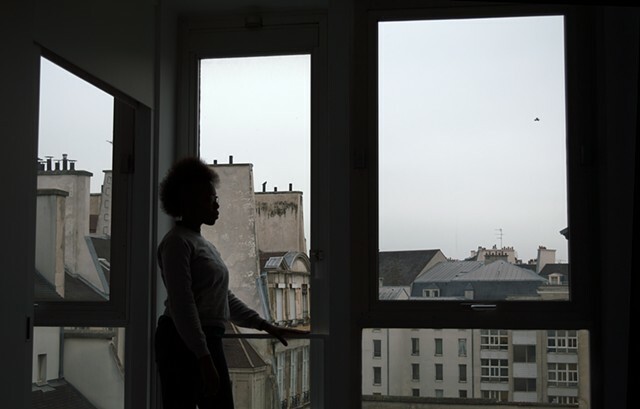 I will be thinking through issues of migration and diaspora - especially in the Afro-Parisian context - through research and studio practice. 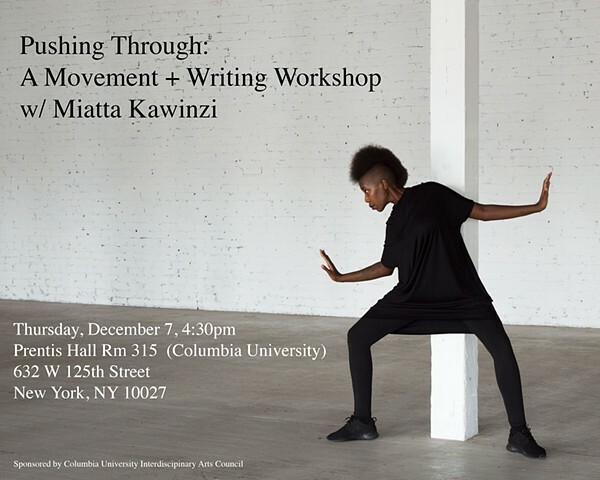 NYC: I will be bringing my Pushing Through workshop to Columbia University. This performative, movement-based workshop uses Theatre of the Oppressed exercises, personal writing, and improvisational techniques to explore the ways in which oppression and resistance are experienced and expressed in, with, and through the body. Amherst, MA: I will be giving a talk on my recent work in the Studio Art Building at Hampshire College. 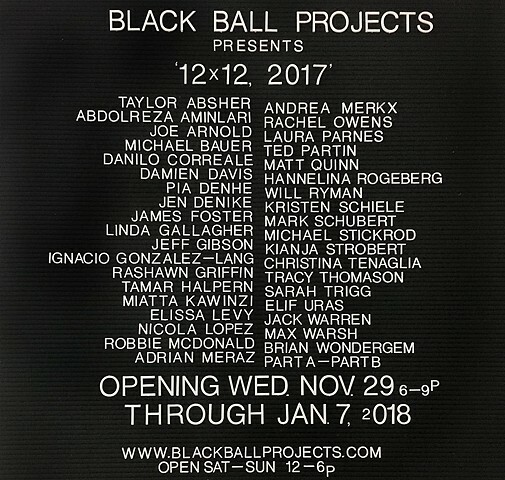 NYC: I am happy to be showing new work in the group exhibition 12 x 12 at Black Ball Projects in Brooklyn. Opening Wednesday, 29 November from 6 - 9 pm, the show will run until 7 January, 2018. Richmond, VA: I will be giving a public lecture on my work as part of my Adjunct Lecturer appointment at the University of Richmond. The artists are performers, dancers, video makers, object makers. They are connected through their individual approaches to their material and expressiveness of embodied existences, and through the sinuous tendons of queer, black, and POC communities. Using their work as they use tools to build, frame, practice, and to repeat; to create approaches that are textual, aware, speak-out-wards and in preservation. Miatta Kawinzi, Assembly (detail), 2017. Vinyl Installation on Window, 80.25 x 69 in. The poet-artists in Of Soil and Tongues discuss and perform elements of their work and the experience of expanding their practice into the Gallery, as part of the 5th Annual Amherst Poetry Festival. South Africa: I am thrilled to be exhibiting in the FNB Joburg Art Fair at the Bag Factory booth (A04) in association with the David Koloane Writers Mentorship Programme. The fair will take place from 8 - 10 September, 2017 at the Sandton Convention Centre in Johannesburg. Miatta Kawinzi, Untitled, 2017. Digital Photograph. South Africa: I am excited to present a solo exhibition of new works created during my Visiting Artist Residency at the Bag Factory. Through video, poetics, sculptural installation, and works on paper, I have been exploring ideas surrounding that which rests beneath the surface and the physical, conceptual, and societal resonances of this notion. I am considering the ways in which the "below" can be a rich site of possibility; a place from which to open up space. South Africa: As part of my Visiting Artist Residency, I will be leading a performative movement-based workshop on Saturday, July 29th from 11am-4pm at the Bag Factory in Johannesburg. This workshop will use Theatre of the Oppressed exercises, personal writing, and improvisational techniques to explore the ways in which oppression and resistance are experienced and expressed in, with, and through the body. RSVP - miatta@mkawstudio.com / linda@bagfactoryart.org.za. Installation View. Photo by Adam Reich. NYC: I am thrilled to be included in Their Own Harlems, organized by Connie H. Choi at the Studio Museum in Harlem. In honor of the centennial of the birth of Jacob Lawrence (1917–2000), Their Own Harlems examines the ways in which the urban landscape has influenced Lawrence’s artistic practice, as well as that of other artists. The works in this exhibition thus consider different aspects of urban life, such as the ritual of moving through the city and the direct observation of scenes on the street, to illustrate how the city has served as a source of inspiration for artists across generations. 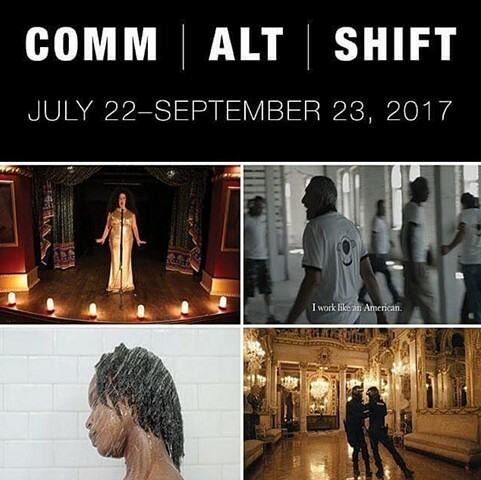 Newark, NJ: I am excited to be included in COMM | ALT | SHIFT, curated by Larry Ossei-Mensah and Dexter Wimberly. The show includes the work of 14 contemporary artists who use video to explore the complexities and angst of modern times. 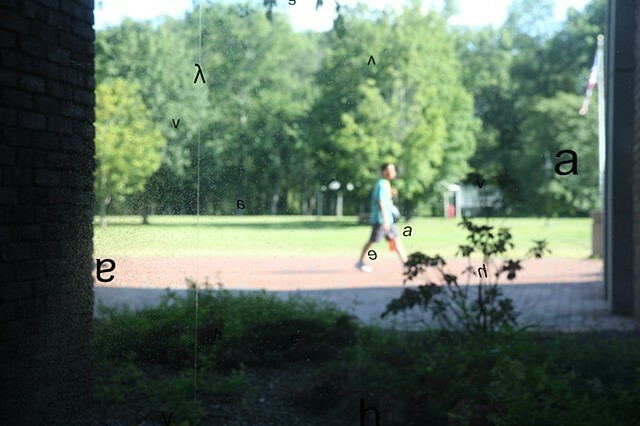 The exhibition's title references keyboard shortcuts or a sequence or combination of keystrokes on a computer that lead to various, yet specified outcomes. COMM | ALT | SHIFT unpacks video as a ubiquitous technology for entertainment, education and escape, as well as a powerful tool for surveillance, manipulation and control. Participating artists: Carlos Aires, Bolo (Saks Afridi and Qinza Najm), Delphine Fawundu, Genevieve Gaignard, Jibade-Khalil Huffman, George Jenne, Miatta Kawinzi, Lin Ke, Jen Liu, Jillian Mayer, Nontsikelelo Mutiti and Dyani Douze, Federico Solmi, Jan Staller, and Rodrigo Valenzuela. NYC: My video La Tercera Raíz is included in make_ place, a cultural production organized by the New York Immigration Coalition (NYIC) and co-curators Eva Mayhabal Davis and Emilia Shaffer-Del Valle. Artists: Yasi Alipour, Laura Anderson Barbata, Lionel Cruet, Isabella Cruz-Chong, Emmanuel Galvez, Giannina Gutierrez, Miatta Kawinzi, Camille Lee, Cela Luz, Gera Lozano, Umesh Mangipudi, PJ Gubatina Policarpio, Tajh Rust, Stephanie Segura, Heriberto Sanchez, Alex Seel, TiJay, & Selina Zawacki. 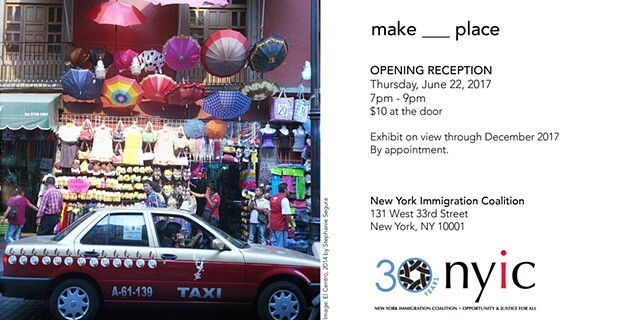 Opening reception Thursday, June 22nd, 7 - 9 pm at the New York Immigration Coalition. 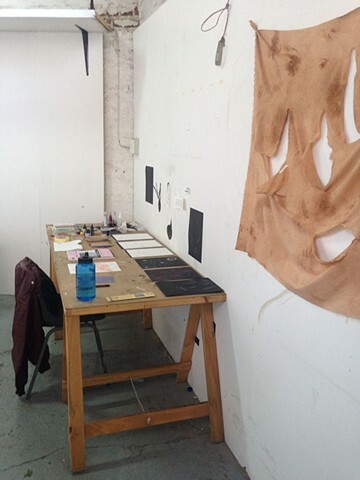 South Africa: I am honored to be an artist-in-residence at the Bag Factory in Johannesburg where I will be developing new work and engaging with the city. 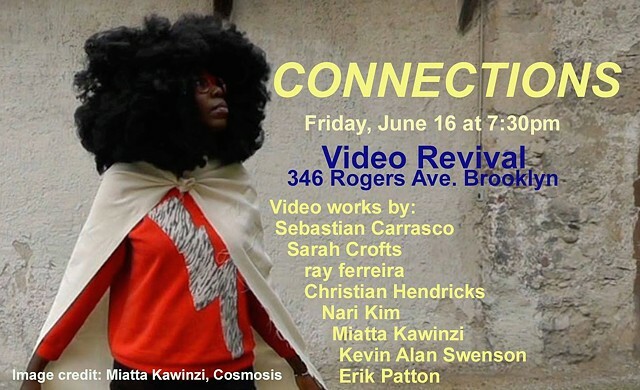 Brooklyn, NY: I am excited to be included in Connections, curated by Betsy Lewin - an evening of artist videos featuring the work of Sebastian Carrasco, Sarah Crofts, ray ferreria, Christian Hendricks, Nari Kim, Miatta Kawinzi, Kevin Alan Swenson & Erik Patton at Video Revival, an independent cinema house in Crown Heights. 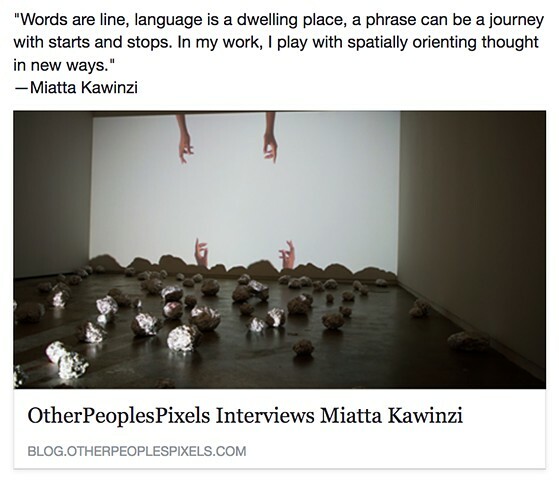 I am thrilled to share this interview on my practice conducted by Stacia Yeapanis for the OtherPeoplesPixels Featured Artist series. I appreciate the opportunity to elaborate on the thinking behind my work. I am so happy to be a vocalist on Track 11: Hunter’s Moon II on the Waning Gibbous album Last Quarter, recorded during my time in Omaha last fall. 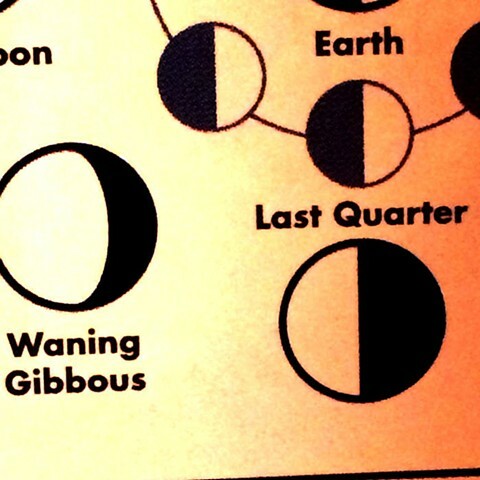 Waning Gibbous is an open collective of musicians based in the mid-western United States that creates and records spontaneously on the evenings of full moons. Miatta Kawinzi, sweat/tears/sea, 2017. Video Still. Amherst, MA: I will be exhibiting a new sound/text/video installation in Of Soil and Tongues at the Hampshire College Art Gallery, exhibiting alongside lê thi diem thúy & Sahar Muradi + Laimah Osman; curated by Amy Halliday and Jocelyn Edens. In this group show, three artist-poets chart paths through language and place in multimedia installations. 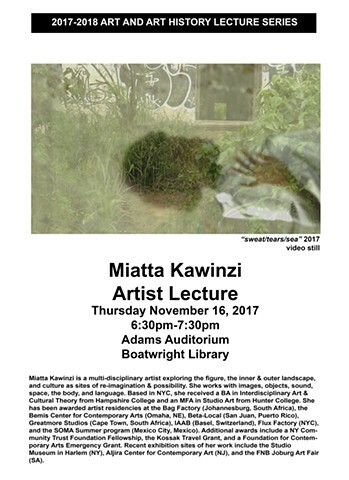 Miatta Kawinzi, Art M.B.F., 2013. Video Still. Brooklyn, NY: I will be screening my video Art M.B.F. at A.I.R. Gallery in OLD NEWS / NEW RULES, a screening & performance program on Sunday, May 21st at 7:30 pm. Organized by Fellow Eleanor King, the event features artists Tiffany Joy Butler, Miatta Kawinzi, Shadi Harouni, Divya Mehra, Joiri Minaya and Elise Rasmussen. NYC: vers (Michael Blake/ray ferreira/Miatta Kawinzi/Erik Patton) performance at Segue Reading series. Curated by Emmy Catedral. How to serve blackberries & cream: Alexa, keep on running. Rich. When heated, masc-arpone melts. It keeps. They demolished. We re-built. Plated. Have four. I’m not sure how to help you with that. Split & scrape. 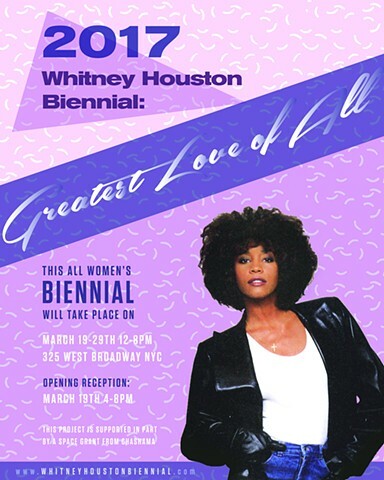 NYC: I am excited to be included in this year's Whitney Houston Biennial, curated by C. Finley. Opening Sunday, March 19th, 4 - 8pm at 325 West Broadway, NYC 10013. 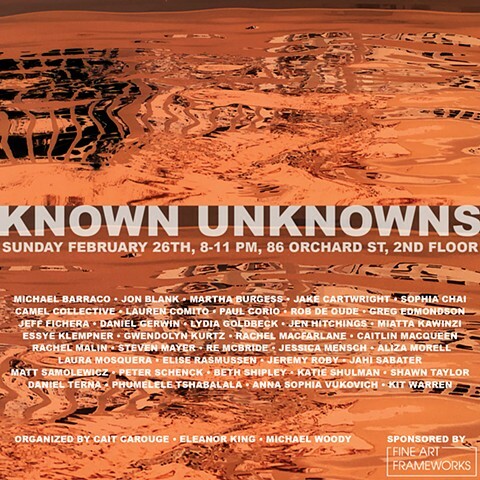 NYC: I am happy to be invited by Eleanor King to show work in Known Unknowns. Opening Sunday, February 26th, 8 - 11pm at 86 Orchard St, 2nd FL, NYC 10002. 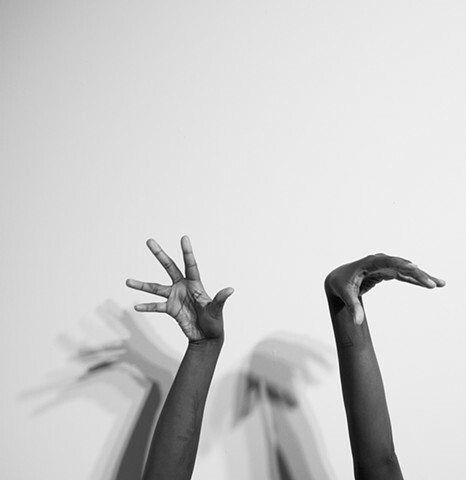 Miatta Kawinzi, Hands Up #1, 2016. Digital Photograph. NYC: I am honored to be a featured artist in Issue 08 of Apogee Journal. The issue launch party will be held on Thursday, 15 December from 7 - 9pm at the Asian American Writers' Workshop. 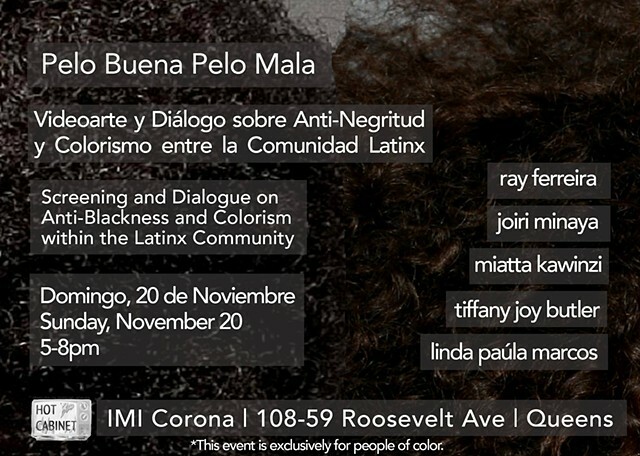 NYC: I will be presenting my video La Tercera Raíz (Spanish version) and co-facilitating discussion at this screening and dialogue on race/colorism within the Afro/Latinx community alongside Tiffany Joy Butler, ray ferreira, Linda Paúla Marcos & Joiri Minaya at Immigrant Movement International in Corona, Queens. Miatta Kawinzi, gatherin' space, 2016. Outdoor Installation View. Color Video Projection & Sound on Loop, Aluminum Foil. Dimensions Variable. Richmond, VA: I am excited to have been invited to present a new iteration of my installation gatherin' space at InLight Richmond, curated by Emily Smith. Organized by 1708 Gallery, InLight Richmond is an annual free public exhibition of light-based art and performances, this year held in Scott's Addition. Miatta Kawinzi, Untitled, 2016. Digital Photograph. Omaha, NE: I will be showing new performance + video work at the Bemis Center's Open House/Open Studios. 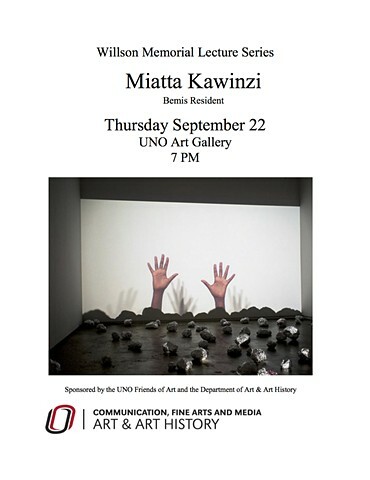 Omaha, NE: I will be giving a lecture on my practice at the University of Nebraska - Omaha's UNO Gallery on Thursday, September 22nd at 7pm. The gallery is located in the Weber Fine Arts building at 6505 University Dr S, Omaha, NE 68182. Omaha, NE: I am incredibly honored to be selected as an Artist-in-Residence for the Sci-Fi & the Human Condition residency at the Bemis Center for Contemporary Arts, a thematic residency focusing on science fiction and the inherent intersectionality of race, class, and gender. 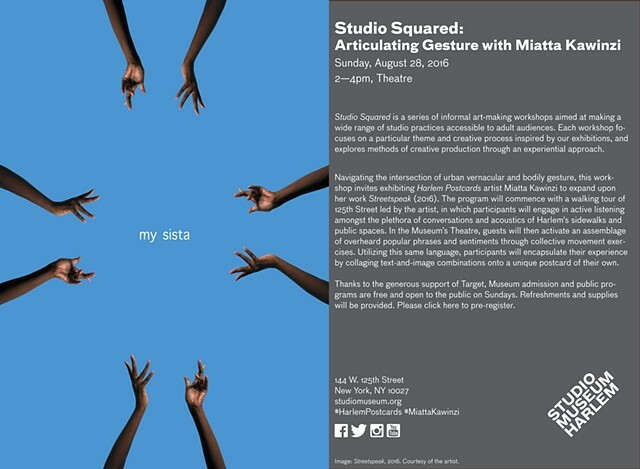 NYC: Please join me for my workshop Articulating Gesture, organized through the Studio Squared Public Programs at the Studio Museum in Harlem. 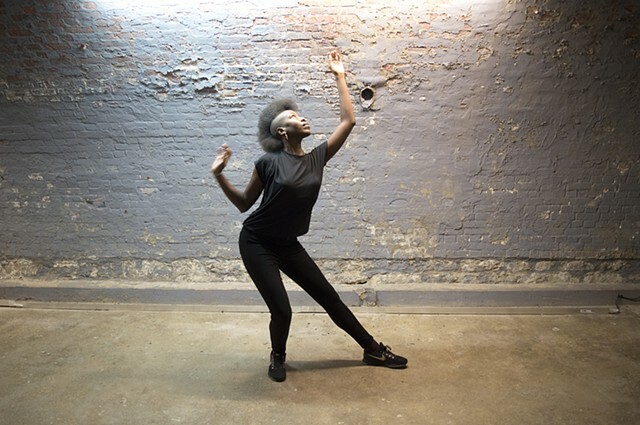 Navigating the intersection of urban vernacular and bodily gesture, this workshop invites exhibiting Harlem Postcards artist Miatta Kawinzi to expand upon her work Streetspeak (2016). 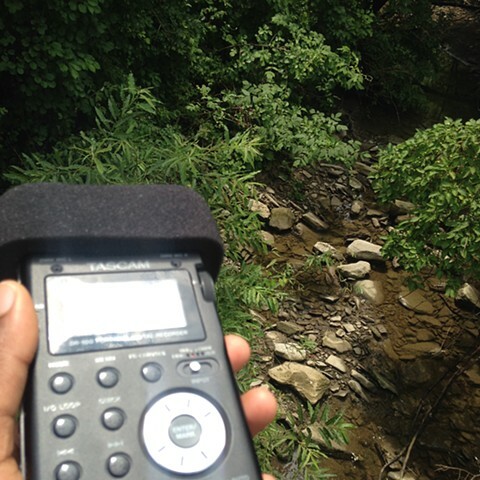 The program will commence with a walking tour of 125th Street led by the artist, in which participants will engage in active listening amongst the plethora of conversations and acoustics of Harlem's sidewalks and public spaces. In the Museum's Theatre, guests will then activate an assemblage of overheard popular phrases and sentiments through collective movement exercises. Utilizing this same language, participants will encapsulate their experience by collaging text-and-image combinations onto a unique postcard of their own. Free & open to the public; you can pre-register here. Puerto Rico: I am excited to participate in the Seminario Itinerante through San Juan's Beta-Local, organized by Beatriz Santiago Muñoz, Anahita Hekmat and Michelle Nonó. 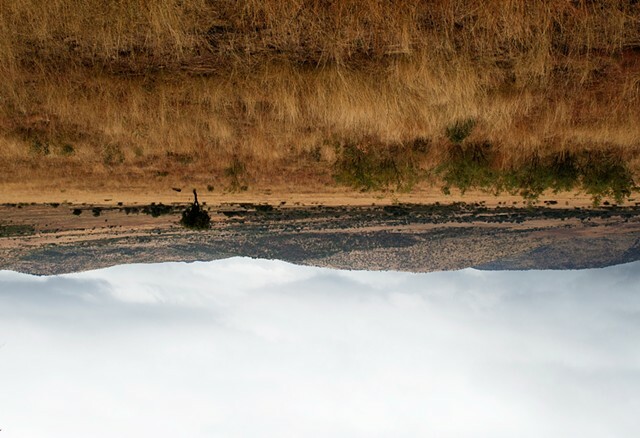 The Itinerant Seminar is a seminar-on-foot for artists who are interested in aesthetics, art, images and language in relation to land, geography, built structures, industrial and military devastation, freedom of movement and migration. 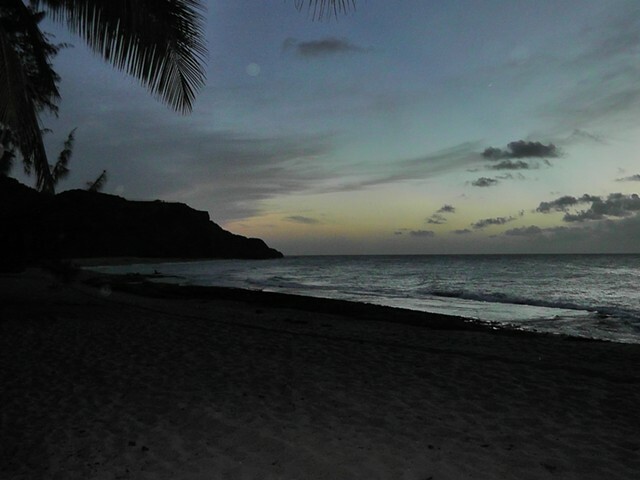 This year's route is along the western coast of Puerto Rico, from Aguadilla to Cabo Rojo. Miatta Kawinzi, Streetspeak, 2016. Archival Inkjet Print, 16 x 20 in. NYC: I am honored to be commissioned to create a new work - Streetspeak - reflecting on Harlem and to be exhibiting at the Studio Museum in Harlem in the Harlem Postcards show, organized by Assistant Curator Hallie Ringle as part of the Summer Exhibition Season, alongside Alannis Alba, John Jennings, and Nontsikelelo Mutiti. NYC: I am pleased to be a panelist/facilitator on Navigating Power & Privilege at the Queens Museum, alongside ray ferreira, Ro Garrido, D’hana Perry, and Kameelah Janan Rasheed through the Open A.I.R. Artist Services Program. The conversation will center on raising critical questions about navigating institutions, examining power and privilege as artists, and sharing collective strategies and tools to support one another. NYC: I am pleased to be included in the group show --- revel ---, curated by Lauren Gidwitz at Kunstraum. Artists: Lindsay M Burke, Jacintha Clark, Matthew Craven, Evan Fugazzi, Miatta Kawinzi, Sangram Majumdar, Esperanza Mayobre, Paul Metrinko, Ellen Uzane Schneiderman & Ashley Nicole Wick. Each artwork draws one into an intrinsic and magical world, each with its own layered and subtle storytelling. They are autonomous but speak to one another freely. The personal histories evoked in each artwork’s world focus on their own intimate experiences, but relate to larger ancient histories and contemporary cultural accounts in the making. The opening reception will be on Sunday, June 5th from 4 - 6pm, and the closing reception will be on Saturday, July 30th from 7 - 9pm at Kunstraum, 20 Grand Ave #509, Brooklyn, NY 11205. Oakland, CA: I will be presenting at the Open Engagement - POWER conference as part of The Hidden Curriculum, collectively running an ongoing translation booth and also facilitating movement-based workshops that draw on Theatre of the Oppressed techniques. These events will be held at the Oakland Museum of California. Opening reception Thursday, April 21st, 6 - 8pm. Hours: Tuesday - Sunday, 1-6PM. I will be showing my thesis work alongside fellow artists Michael Blake, Ryan Brennan, ray ferreira, Priscilla Fusco, Adam Golfer, Takayuki Kubota & Erik Patton. NYC: I will be showing new work at Hunter College MFA Open Studios from 6 - 10pm on Friday & 2 - 6pm on Saturday. The studios are located at 205 Hudson St in Tribeca and I'm in #374. This will be an opportunity to see what I've been working on in preparation for my thesis show coming up in the spring. I am honored to show my work alongside this group of thought-provoking artists. Mexico City, Mexico: I will be showing new work made this summer in Mexico at SOMA Summer's closing event. Participants: AK/OK, Shobun Baile, Niels Bekkema, Lyndsay Bloom, Francesco Cagnin, Barb Choit, Olmo Cuña, Erin Diebboll, Gail Dodge, Caroline Doherty, Sara Eliassen, Sara García, Shadi Harouni, Audrey Hope, Einat Imber, Maria Iorio & Raphael Cuomo, Miatta Kawinzi, Eleanor King, Kiyoto Koseki, Laura McMillian, Omar Mismar, Alberto Morreo, Francesco Nazardo, Cristine Posner, Barbara Rauch, Raquel Solórzano Cataño, Elisa Strinna, Shawn Taylor, Ana Wolovick, Vere van Gool, Linda Voorwinde & Claire van Lubeek. Wednesday, August 26th, 6PM at SOMA, Calle 13 #25, Col. San Pedro de los Pinos, 03800 Ciudad de México. Mexico City, Mexico: I will be performing at the Centro Cultural Universitario Tlatelolco in Sobre la presentación/On presentation, a performative function produced by SOMA Summer 2015. Sobre la presentación/On presentation is composed of a series of temporal interventions in a conference room at the Centro Cultural Universitario Tlatelolco. Designed to coincide with the exhibition T de Tlatelolco: Arte, Arquitectura e Historia, this event brings together works that contend with the bureaucratic history and aesthetics of the site formerly occupied by the Mexican Ministry of Foreign Relations. Mexico City, Mexico: I am honored to be selected to participate in this year's SOMA Summer program, a unique and dynamic eight-week program for international artists, curators, critics, and art historians designed to promote intense creative work and open dialogue. We will focus on theories of excess departing from Georges Bataille and re-examine the Mexican Baroque, and the program culminates in a showcase of new work. I am grateful to receive a scholarship to attend from Hunter College. Newark, NJ: My video Clay has been selected for the FILMIDEO 2015 film festival at Index Art Center, 237 Washington St in Newark, NJ. The festival is on Saturday, April 18th from 6 - 10pm. NYC: I will be showing paintings in The Artivist Rises, a group exhibition honoring the role artists play in raising consciousness during times of struggle at the 1199SEIU Bread & Roses Cultural Project Gallery, 310 W 43rd St, NY 10036. Opening reception: Friday, 17 April, 6 - 9pm. Organized by African Voices magazine. Artists include: Jamel Shabazz, Ansel Butler, Ocean Morisset, Demar Douglas, Malik Seneferu, Lisa DuBois, Marcellous Lovelace, Imari DuSauzay, Miatta Kawinzi, Paula Wynter, Jalani Morgan, Jimbe' Carroll, Tyson Hall, Derick Cross, Laronz Murray & Aziza. NYC: I will be showing new work at Hunter College MFA Open Studios from 6 - 10pm on Friday & 2 - 6pm on Saturday. The studios are located at 205 Hudson St in Tribeca and I'm in #374. 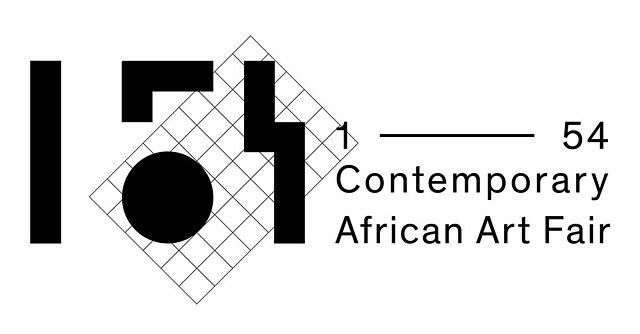 NYC: I will be in the group exhibition After Afropolitan, curated by Aisha Bell Caldwell, Desiree Gordon, Daapo Reo and Yolanda Sangweni & presented by CCCADI, afriPOP!, and Weeksville Heritage Center. Artists: Cosmo Whyte, Dennis R. Darkeem, Glendalys Medina, Ifeatuanya Chiejina, Imani Shanklin Roberts, Miatta Kawinzi, Murktarat Yussuff, Salym Fayad, Selam Bekele, Valerie Piraino, Vaughn Spann, Aisha Cousins, Delphine Fawundu, Delphine Diallo, Awol Erizku, Derrick Adams, Sana Musasama, Sol Sax, Nontsikelelo Mutiti, Danny Simmons, Simone Leigh, Jamilla Okubo, Folasade Adeoso, Laolu Senbajo and Zina Saro-Wiwa. Opening Wednesday, 4 February, 6 - 9 pm at Weeksville Heritage Center, 158 Buffalo Ave, Brooklyn NY. Artist talks from 12pm on Saturday, 7 February; I'm up at 4pm. NYC: I will be in the show Exquisite Corpus, an artist-invite-artist, telephone-style chain resulting in a group exhibition. This show is an experiment of our artistic networks, how we communicate through our craft rather than wall statements, and how we create a body of work through many different eyes, resulting not only in a group show but a collective curation. Opening 23 January from 8 - 11pm with a community banquet at the Industry City Distillery, 33 35th St, 6th floor, Brooklyn, NY. Portland, Oregon: My video Star Spangz is included in the juried international group exhibition Translations presented by Emergent Art Space. The online exhibition is here and the live exhibition is at the Feldenheimer Gallery at Reed College, 3203 Southeast Woodstock Boulevard, Portland, OR. "What is lost in translation and what is found?" New York: Desiree Mwalimu and Tiziana Rinaldi-Lewis, co founders of The Portal and the Whale Medicine Theater, an interactive and experimental performance company, mount a specially commissioned pre-solstice exploration of Sincerity and Revelation. 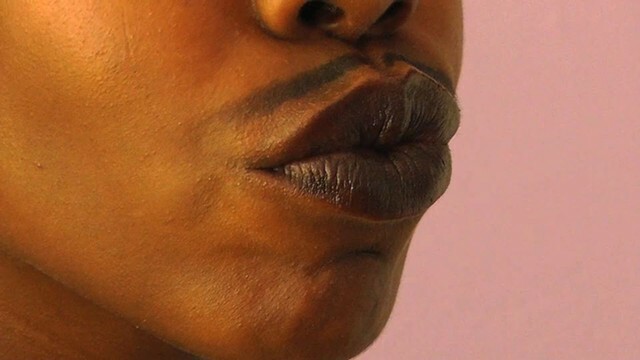 The performance will be set to the backdrop of work from Miatta Kawinzi and ray ferreira of the Vers Artist Collective, which explores the queer perspective in art and art culture. Join us for the presentation and post performance reflections with these Emerging artists in this maiden voyage of our newest series, EMERGE – enabling New Work, New Art, and New Knowledge. This event is put on by the Caribbean Cultural Center African Diaspora Institute (CCCADI) | $5 in advance, $10 at the door. Children under 12 years of age free. For tickets in advance, please visit emergeseries.eventbrite.com. NYC: I will be exhibiting new prints in Small is Beautiful at Flowers Gallery in Chelsea. The opening will be on Thursday, 20 November from 6 - 8 pm at 529 West 20th St.
NYC: I will presenting on my travels and residency in Cape Town, South Africa during May - August at the Kossak Travel Grant reception at 205 Hudson St, Room 202. The event will be from 7 - 9pm. 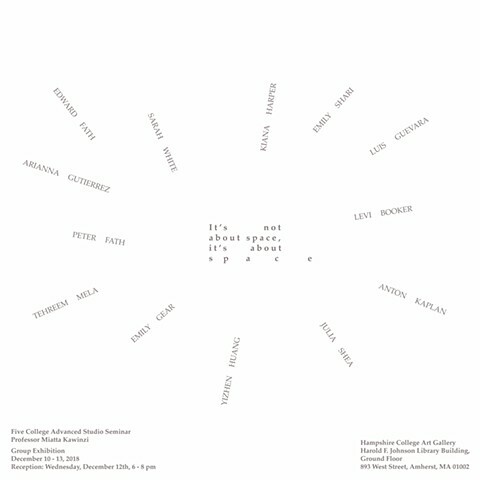 NYC: I will be showing new work at Hunter College MFA Open Studios from 6 - 10pm on Friday. The studios are located at 205 Hudson St in Tribeca and I'm in #355. I am also in the Vers Collective group show, From one lover to another, we rely on each other in Room 312. I am honored to be featured in the online edition of Infinity's Kitchen, an experimental literary journal. My video Star Spangz can be viewed in the latest edition here. South Africa: I will be showing new work made in Cape Town at Some Bodies, the visiting artists group exhibition at Greatmore Studios, alongside Emoke Bada and Philiswa Lila. The opening reception will be on Friday, 8 August from 6pm, Greatmore Studios, 47-49 Greatmore Street, Woodstock, Cape Town. South Africa: I am honored to be an artist-in-residence at Greatmore Studios in Cape Town for three months with generous funding from Greatmore & the South African National Lottery Distribution Trust Fund. Thanks also to the Kossak Travel Grant from Hunter College. NYC: I will be showing new work at Hunter College MFA Open Studios on Friday 14 March from 6 - 10pm and Saturday 15 March from 2 - 6pm. The studios are located at 205 Hudson St in Tribeca and I'm in #355. I am also on the cover of the brochure here. NYC: I will be in the group show B/\MVY AB;$L<Y curated by Pfeiffer McNay and Patrick Mohundro opening Saturday 15 February from 7-10pm. The show is at 2001 7th Ave, NY 10027 in Harlem. NYC: I will be in the Honest Bodies exhibition curated by Zachary Frater at the Windows on Amsterdam Gallery at the City College of New York located at 136th St & Amsterdam Ave. The opening reception will be held on 16 January from 5-7pm, and the closing reception will be held on 11 February from 7-10pm. NYC: I will be participating in the Flux Factory benefit art auction at Art in General, 79 Walker St, 6th floor. There is an extensive list of inspiring artists who donated work to support this dynamic non-profit space/organization. NYC: I am now a candidate in the Studio Art MFA program at Hunter College. I will be showing new work at Open Studios on Friday, November 8th from 6-10pm and Saturday, November 9th from 2-6pm. 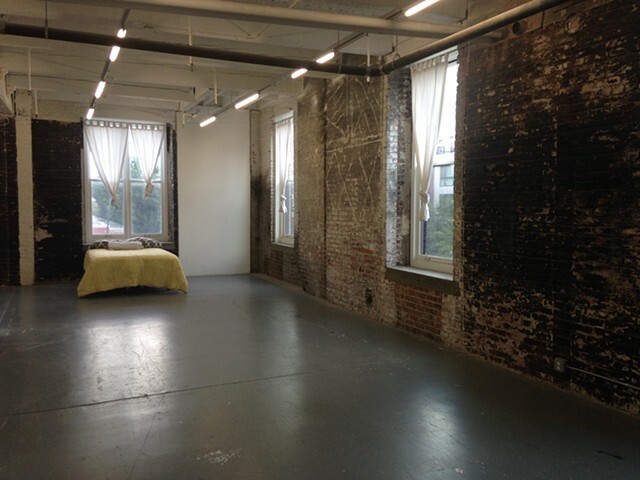 The MFA studios are located in Tribeca at 205 Hudson St (entrance on Canal). NYC: My work will be in the group exhibition Power Play curated by Angela Washko. Opening: 17 December, 5pm-8pm, Roy Wilkins Family Center, 177-01 Baisley Avenue, Jamaica, NY. Participating Artists: Aliya Bonar; Jason Eppink, Kelly Goeller, and Adrienne Silverman; Sarah Kodish Eskind; Miatta Kawinzi; Robert Moya; Alison Nguyen; Don Porcella; Rob Ray; Angela Washko; Tim Winn & Zehra Khan. Presented by Art Connects New York & the Southern Queens Park Association, where my work will join the public collection. San Francisco, California: I will be performing in Rashaad Newsome's Shade Compositions at the San Francisco Museum of Modern Art (SFMOMA) in the Haas Atrium at 9PM. Trinidad & Tobago: My film Urbn Majik will be part of the New Media showcase presented by the trinidad + tobago film fest 12 in collaboration with ARC Magazine. It will screen at the University of the West Indies on the 28th and at Medulla Art Gallery on the 28th & 29th. I am honored to be an Artist-in-Residence in Basel/Riehen, Switzerland at the International Exchange & Studio Program Basel (iaab) through Galapagos Art Space. Switzerland: Exhibition with Chantelle Gomez, Sophie Jung & Mahatat at Schlosserei in Basel. Opening 14 June at 18h. Rheingasse 33. Switzerland: I will be showing my new video Cosmosis in this group show of iaab artists-in-residence. Switzerland: I will be exhibiting new work in a group exhibition with Maurice Mbikayi and Janne Nabb & Maria Teeri - Traces from iaab - at dock in Basel. dock has a physical and online archive of local Basel artists and a window exhibition series. The opening is Friday, 24 February at 18h (6pm). NYC: My video work will be screening on television as part of the Flux Factory residents & alumni episode for Vaudeville Park's Video Vaudeville. It will air on 17 January at 10pm (TWC Channel 67, RCN Channel 55). NYC: I am honored to be an artist-in-residence at Flux Factory, a laboratory for cross-disciplinary exploration and platform for local and international artists, with full funding through the NY Community Trust. On Thursday, December 8, 2011 from 7-9 PM, Miatta Kawinzi will hold an opening reception for her solo show Am I Phthalo Blue? at 3rdEye(Sol)ation Gallery in Brooklyn, NY. The gallery is located at 1501 Broadway, J train to Halsey. The work will also be on view Saturday, December 10 from 3-7PM, and by appointment. 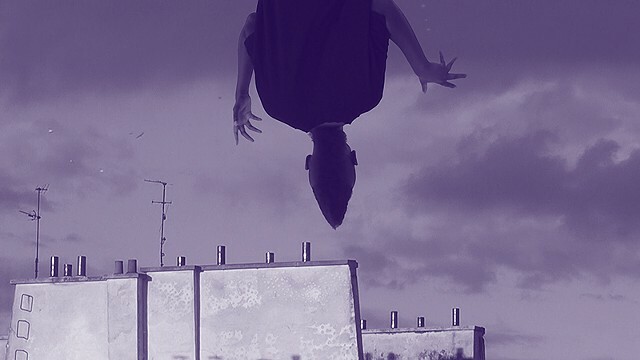 Through an array of mediums including painting, video, and installation, the show will reflect on themes of alienation, urban mysticism, the current socio-political climate, and the potential for transcendence in a climate of concrete.